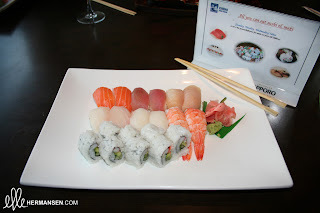 Tonight I had a wicked Japanese dinner in London, Ontario - at Ichiban Sushi House! I must say that I have been quite impressed and never disappointed with the freshness of the seafood that they use in this chain. Maybe next time I will take a small vial of my own gluten-free soya sauce to enjoy the fish proper! If you have an Ichiban in your area, I say check it out - as it is fun to sample and it's the only place I've seen where they serve you a wooden Viking-styled boatload of sushi!